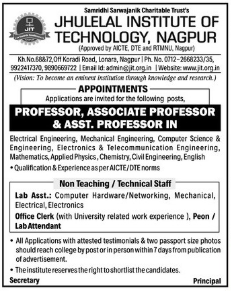 Jhulelal Institute of Technology, Nagpur has advertised in Lokmat newspaper for the recruitment of Professor/Associate Professor/Assistant Professor jobs vacancies. Interested and eligible job aspirants are requested to apply with in 7 days. Check out further more details below. About College: Jhulelal Institute of Technology is governed by Samridhi Sarwajanik Charitable Trust with a noble cause of providing quality technical education to the students in Central India. The society has eminent persons from the fields of technology and education on its governing body and academic advisory council.